The coast of Maine is designed by nature as a prime playground for kids. Most obvious are the miles of beaches all along the coast. The water can be a bit chilly, but kids don’t seem to mind. Favorites for the littlest ones are Long Sands in York, Crescent Beach, Ogunquit and Lincolnville Beach which has a long stretch of shallow water perfect for splashing and making sand sculptures. Old Orchard Beach with its arcades and shops is a favorite with teens. Bar Harbor is a great lesson in understanding the tides with the bar that is completely covered at high tide and walkable at low tide. Just keep an eye on the changes to keep from being stranded! Shore and cliff walks are a great family activity. Scarborough Beach State Park boasts the Prouts Neck Cliff Walk with views of the ocean and magnificent homes and Ogunquit’s cliff walk is a short stroll for little legs. Climb the tower at the Portland Observatory and scan the sea for your ship to come in as did 19th century ship owners. And don’t forget that Maine has 65 lighthouses to delight kids and adults alike (see our story about lighthouses). 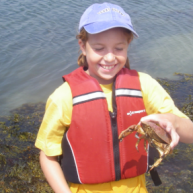 Participating in harvesting Maine’s sea’s abundant resources is great for showing kids where their food comes from while satisfying their enthusiasm for all things wiggly. Take ride on a working lobster boat and help haul the traps and sort the catch, dig for clams, or fish off the Maine State Pier. Boats of all sizes are another draw. 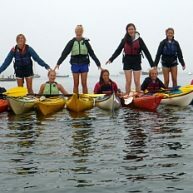 Rent kayaks at the Maine Island Kayak Company in Portland or Maine Sports in Camden and cruise the waters yourself. Take the Casco Bay Ferries or a mailboat for a tour of the islands or for a ride in search of whales or puffins. Many coastal towns also have sailing trips on sailboats and windjammers. 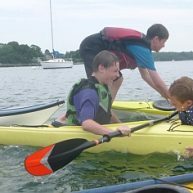 This is just a sample of some of the activities and places to get your kids in touch with the outdoors and the coast. 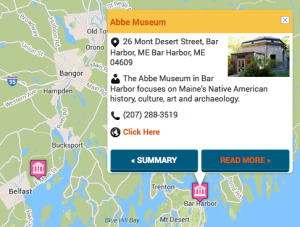 You are sure to find many more opportunities as you explore the coast all the way from Kittery to Eastport.